item 1 Gotham Steel 10-Piece Complete Kitchen Nonstick Copper Pan & Cookware Set - NEW! 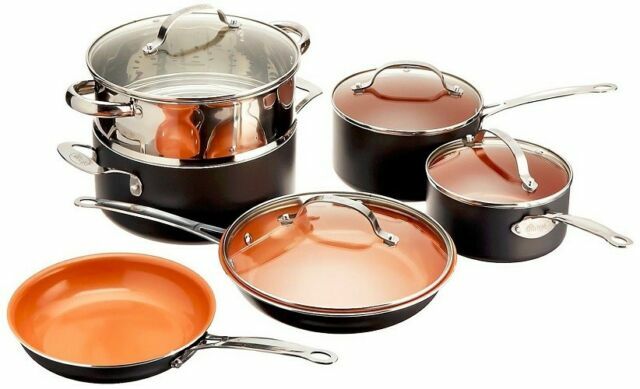 -Gotham Steel 10-Piece Complete Kitchen Nonstick Copper Pan & Cookware Set - NEW! Performs as stated, easy to use and great that u can use them in the oven up to 500f. Only Drawback is that the metal handles on the pot covers get too hot when simmering sauces/soups/vegetables, burned my fingers first time I used the pots/pans with the lids......I know better now but a silicone cover on pot/pan lid handles, like Kitchen Aid have, would be much better. We have only started to use this product so I can't comment on long-term usage, but so far we have two comments: - These are beautiful! The colours and aesthetic is stunning. - They truly are nonstick. We are so happy with their ability to shed leftover food and sauces. Very happy and would recommend! Hi, i am very happy with this product. If i compare with red coper product it's simple, the Red Coper pan are simply bad for cooking ham & egg, so imagine cooking other meal with a sticky pan. The Red Coper square dance pan still not good because it still stick after cooking meal. But Gotham product is doing a none sticky meal, that's perfect for me. I,M very satisfied with Gotham product. Thank You. I finally got my set out to try them, I can't begin to tell you how disappointed I was when after I cooked it both the food sticked to them. I had to set them in water for a while before the food would come off of them. I was so looking forward to never having to do that again, I had bought the crisper pan elsewhere and I have no problem with it at all with food not coming off . I just used a paper towel and the food came right off. I guess this set must have be recalled because it is defected so they were selling them cheap on ebay. Again I am very disappointed. I love the set and it was great value. My only complaint is that the handles on the glass lids get VERY hot when you use them. I burnt myself the first time but now have a pot holder handy when I want to lift the lid. Ihave other pots with glass lids that do not do that so it is a bit disappointing. ALL CLAD D5 STAINLESS STEEL FRENCH SKILLET SET PAIR 11" AND 9", NEW, BEST OFFER!